MURMANSK – Murmansk has said goodbye to the nuclear maintenance vessel Volodarsky – a second floating radiation hazard to be decontaminated and dismantled after the Lepse, whose dismantlement schedule is, however, yet to be set, was finally last September towed out of Murmansk for scrapping. A third nuclear service vessel, the Lotta, is next in line. The Volodarsky has been towed for dismantlement to Sayda Bay, a naval base in the far northern parts of the Kola Peninsula that serves as a storage site for the hulls and reactor compartments of decommissioned nuclear submarines. The dismantlement project was developed in 2009 to 2011. Prior to the voyage to Sayda Bay, the ship was examined for possible defects or vulnerabilities – such as hull cracks or other damage; pre-towing works also included repairing the mooring equipment on board, ballasting – placing ballast in such a way as to yield the desired stability, draft and trim of the ship – painting the signal waterlines, and installing the towing equipment. In April 2013, the Volodarsky was docked for inspection of the hull for possible defects. The vessel was deemed ready for a towage trip. The Volodarsky was built in 1928 at Baltiysky Zavod shipyard in St. Petersburg. In 1966 to 1969, it was retrofitted at Kanonersky Shiprepairing Yard, also in St. Petersburg, to serve as a nuclear maintenance vessel to service nuclear-propelled icebreakers. In 1991, the ship was re-classified as a non-self-propelled vessel to be used for temporary storage of radioactive waste and technological equipment with surface radioactive contamination. In 1998, the Volodarsky underwent conversion: all external hatches were sealed and all combustibles removed from the ship. The vessel currently holds low-level and medium-level radioactive waste and radioactively contaminated equipment. The Volodarsky dismantlement project is part of a federal target program for nuclear and radiation safety for 2008 to 2015. The program has a budget of RUR 2.02 billion ($61.36 million) earmarked from the Russian federal budget and RUR 940 million ($28.6 million) in technical support – funds planned to be spent on dismantling the Volodarsky, Lepse, and Lotta, developing a concept for decommissioning vessels with nuclear propulsion systems on board (such as nuclear icebreakers), and other works. By the end of 2014, the storage site in Sayda Bay should take delivery of two more large-size sealed containers packed with sections of the Volodarsky’s former holds used to store radioactive waste – all that will be left of the ship. Last September, the Lepse – also a former nuclear fleet support vessel that was used to haul nuclear fuel and radioactive waste and that remained, filled to the brim with spent nuclear fuel assemblies, since 1988 at dockside at an Atomflot port, just four kilometers north of Murmansk, a city with more than a quarter of a million residents – was finally sent off to a naval yard called Nerpa, further out to sea in Murmansk Region, where parts of the ship are now waiting to be scrapped. The hull of the ship, where the radioactive materials are located, will be stored on land for dismantling. The Lepse dismantlement project, many years in the making and having cleared an obstacle course of red tape and technical paperwork both on the Russian side and as part of international cooperation efforts, has found itself “stuck” at Nerpa, as the single dismantlement spot happened to have already been spoken for by the first Soviet nuclear submarine, the Leninsky Komsomol. But according to Zolotkov, the Volodarsky case is not as complicated. 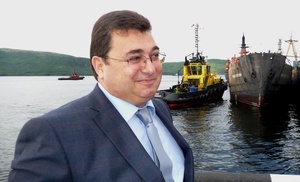 “This vessel only holds solid radioactive waste, and the SevRao branch in Sayda Bay is meant exactly for handling this type of waste,” Zolotkov said, referring to a nuclear and radioactive waste management entity operating under the purview of the Russian State Atomic Corporation Rosatom. Zolotkov said the fewer old and out-of-commission vessels that pose a radioactive hazard remain moored at Atomflot’s wharfs, the better it is from the point of view of environmental safety, since any accident or incident involving such a vessel makes it a potential source of radioactive contamination for the waters of Kola Bay – which wash against the ports of Murmansk and Severomorsk – and the adjacent territories, including the city of Murmansk. According to Kashka, the third in line for decommissioning and scrapping is the nuclear service ship Lotta. The Lotta, baptized Pavlin Vinogradov, was built in 1960 and converted in Murmansk into a nuclear service ship in 1984, when it also received its new name. The ship has two holds for storing spent nuclear fuel with a combined storage capacity of over 4,000 spent fuel assemblies. Only after all of the spent fuel on board the Lotta has been removed will the ship cease to be the nuclear hazard it is today and will be cleared for pre-dismantlement preparations, which will involve cutting off certain sections and removing the vessel’s equipment, among other operations. According to Kashka, the Lotta will then be cold stacked, converted, completely prepared and, possibly, put on a track to a scrapping yard, just like the Volodarsky, under a next federal target decommissioning program. Aside from decommissioning its service vessels, Atomflot is furthermore in the process of saying goodbye to some of its older icebreakers. One such ship is the nuclear icebreaker Rossiya, which Atomflot has decided to take out of commission even though the vessel’s service life term has not yet expired. The necessary paperwork has already been compiled in preparation for decommissioning the ship. “The icebreaker has served for over 134,000 hours, though its useful life period has been extended to 150,000 hours,” Atomflot’s Kashka told Bellona. The decision to decommission the icebreaker, which has plied the Arctic seas for over 28 years, was made after experts had expressed doubts regarding continued safe operation of the nuclear reactor on board. Kashka said there had been failures during the icebreaker’s operation that involved some of the primary equipment in the ship’s propulsion system – namely, steam generator leaks. Other nuclear vessels that are currently undergoing decommissioning are the icebreakers Arktika and Sibir, which were taken out of operation earlier.